Coming off a 3-8-1 record in 1956 in their first year under Head Coach Hugh Devore, the Philadelphia Eagles did well in the high rounds of the ’57 NFL draft. With the seventh pick in the first round, they took FB Clarence Peaks of Michigan State. Further seeking to bolster the running game, they chose Wake Forest HB Billy Barnes in the second round and HB Tommy McDonald from Oklahoma in the third. And in the fourth round, they drafted QB Sonny Jurgensen of Duke. The stocky (5’11”, 195) Jurgensen had not thrown the ball much in college with a run-oriented team, but was reputed to have a strong arm and had shown great accuracy when he did pass. For the past several years, the Eagles had utilized the quarterback tandem of Adrian Burk and Bobby Thomason, and with Burk having retired to pursue a legal career there was a need to break in someone new. Peaks and Barnes moved directly into the starting lineup while McDonald, who was too small at 5’9” and 182 pounds to play running back as a pro, would not make an impact until later once he was shifted to flanker - and the impact would indeed be great. Jurgensen backed up the veteran Thomason as Philadelphia lost its first three games. On October 20 the Eagles faced the Cleveland Browns, who were off to a 3-0 start under Head Coach Paul Brown and had beaten Philadelphia at home the week before. They had a promising rookie of their own in FB Jim Brown, taken in the first round of that same draft out of Syracuse. Brown had already become the key to the ground-oriented offense directed by veteran QB Tommy O’Connell while second-round draft choice Milt Plum from Penn State, the quarterback of the future, backed him up. The previous week’s game in Cleveland was a fight-filled contest in which seven players were ejected. Commissioner Bert Bell issued a warning prior to the rematch that the teams should “play football, not fight”. By and large his instructions were followed in the rematch. There were 22,443 in attendance at Connie Mack Stadium as Sonny Jurgensen started at quarterback for the injured Thomason. There was no scoring in the opening period but the Eagles, with Billy Barnes running well, advanced to the Cleveland 8 yard line on the last play of the first quarter. On the second play of the second quarter, Bobby Walston kicked a 12-yard field goal to give the home team a 3-0 lead. The Browns failed to tie the score later in the period when Lou Groza’s 39-yard field goal attempt into a stiff wind went wide. Philadelphia later put together an 80-yard drive in six plays, with Jurgensen passing to end Rocky Ryan, who pulled the ball in at the 15 and ran it in for a 46-yard touchdown. The Eagles held a 10-0 lead at the half. The third quarter was scoreless, but then Philadelphia put together a seven-play, 45-yard scoring drive after LB Chuck Bednarik intercepted a pass by Tommy O’Connell and returned it 14 yards. Barnes ran for 14 yards and, after carrying again for a short gain, Clarence Peaks broke away for a 25-yard carry to the one yard line. On second down, Jurgensen scored on a quarterback sneak. O’Connell was injured and replaced by the rookie Milt Plum, who led Cleveland on a 69-yard drive midway through the fourth quarter. Following a pass from Plum to HB Billy Reynolds to the Philadelphia one, Jim Brown blasted into the end zone for a touchdown. That was it for the Browns as the Eagles held on for a 17-7 win. The Browns outgained the Eagles (285 yards to 270) although Philadelphia surprisingly outgained Cleveland on the ground (186 to 103). The Browns had the edge in first downs (14 to 13) but they also turned the ball over six times, four by interception, while Philadelphia gave the ball up just once on a fumble. While there wasn’t the fighting of the previous week’s game, there were a total of 16 penalties called – 10 on the Browns and six on Philadelphia. Billy Barnes (pictured at left) rushed for 87 yards on 22 carries, overshadowing Jim Brown, who had 53 yards on 12 attempts. Sonny Jurgensen didn’t go to the air often, but was effective in his first career start as he completed 6 of 9 passes for 84 yards with a touchdown and none intercepted. The upset of the Browns didn’t herald better things for the Eagles – they were shut out at Pittsburgh the next week and won only three more times to finish at 4-8 and in fifth place in the Eastern Conference, leading to the replacement of Hugh Devore as head coach by Buck Shaw. Cleveland, on the other hand, lost only once more to top the conference at 9-2-1, although the Browns lost badly to Detroit in the NFL Championship game. Sonny Jurgensen started five games as a rookie and showed promise as he completed 33 of 70 passes for 470 yards with five touchdowns and eight interceptions. The arrival of veteran star Norm Van Brocklin from the Rams in 1958 relegated the young quarterback to the bench and he would not re-emerge until 1961, the year after “The Dutchman” guided the team to the league title and then retired. 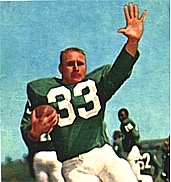 However, Jurgensen broke out in a big way in ’61 on his way to a Hall of Fame career with the Eagles and Redskins. Billy Barnes also had an impressive first year, gaining selection to the Pro Bowl as he rushed for 529 yards on 143 carries (3.7 avg.) and caught 19 passes for 212 more. Jim Brown outdid the rest of the rookie class, however, as he led the NFL in rushing with 942 yards on the way to becoming the league’s dominant rusher over the course of a brilliant nine-year career that, like Jurgensen's, led to enshrinement in Canton.